"Roger Angell has been writing about baseball for more than forty years . 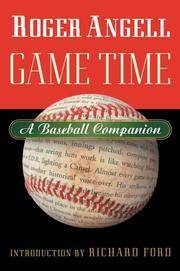 . . and for my money he's the best there is at it," says novelist Richard Ford in his introduction to Game Time. Angell's famous explorations of the summer game are built on acute observation and joyful participation, conveyed in a prose style as admired and envied as Ted Williams's swing. Angell on Fenway Park in September, on Bob Gibson brooding in retirement, on Tom Seaver in mid-windup, on the abysmal early and recent Mets, on a scout at work in back-country Kentucky, on Pete Rose and Willie Mays and Pedro Martinez, on the astounding Barry Bonds at Pac Bell Park, and more, carry us through the arc of the season with refreshed understanding and pleasure. This new selection represents Angell's best writings, from spring training in 1962 to the explosive World Series of 2002, with many chapters not previously seen in book form. Harcourt. Hardcover. 0151008248 New Condition. . New. Mariner Books. PAPERBACK. 0156013878 New Condition. . New. Harcourt. Hardcover. 0151008248 New Condition *** Right Off the Shelf | Ships within 2 Business Days ~~~ Customer Service Is Our Top Priority! - Thank you for LOOKING :-) . New. San Val. Used - Good. Former Library book. Shows some signs of wear, and may have some markings on the inside. Harcourt. Hardcover. 0151008248 Like New Condition. . Fine. Mariner Books. PAPERBACK. 0156013878 Like New Condition. . Fine. Mariner Books. PAPERBACK. 0156013878 Special order direct from the distributor . New. Harcourt. Hardcover. 0151008248 Ships from Tennessee, usually the same or next day. . New. 2003. Harcourt Brace & Co., 2003. First Edition. First printing. This is a new book with minor shelfwear. It provides historical facts and anecdotes about baseball between 1962 and 2002 taken from the author's writings about the sport and the players.. Hard Cover. As New/As New. 6 1/2 x 9 1/2. Harcourt, 2003-04-01. 1. Used - Like New. Used Like New, no missing pages, no damage to binding, may have a remainder mark. Harcourt, 2003. Trade Paperback. Fair. Harcourt: Harcourt, 2003. First Edition. Hardcover. Fine/Fine. Split cloth with gold lettering, xviii, 398pp., as new condition, Full refund if not satisfied. Harcourt. Hardcover. 0151008248 . Good. 2003. Orlando, FL, Austin, TX, et al. : A Harvest Book/Harcourt, Inc., 2004. 1st Harvest Edition: 2004 . Trade Paperback. Brand New. 8vo or 8° (Medium Octavo): 7¾" x 9¾" tall. Vaughan Andrews (Cover Design). 398 pp. Copy in pristine state. Orlando, FL, Austin, TX, et al. : A Harvest Book/Harcourt, Inc., 2004. 1st Harvest Edition: 2004 . Trade Paperback. Brand New. 8vo or 8° (Medium Octavo): 7¾" x 9¾" tall. Vaughan Andrews (Cover Design). 398 pp. Book in pristine state save minor stains on bottom edge. Mariner Books. Paperback. 0156013878 . Good. 2004. Orlando, Florida, U.S.A.: Harvest Books, 2004 Book. Very Good. Trade Paperback. Very good trade paperback. Nice clean tight copy..
Mariner Books. PAPERBACK. 0156013878 Ships from Tennessee, usually the same or next day. . New. 2004. Harvest Books. Used - Like New. Ships from Reno, NV. Book in almost Brand New condition. 100% Money Back Guarantee. Shipped to over one million happy customers. Your purchase benefits world literacy! Harvest Books. Used - Good. Former Library book. Shows some signs of wear, and may have some markings on the inside. Harcourt. Used - Good. Good condition. Good dust jacket. Bookplate inside. Stamped on inside. Mariner Books. Used - Good. Good condition. Houghton Mifflin Harcourt Publishing Company, 2004. Paperback. Very Good. Disclaimer:A copy that has been read, but remains in excellent condition. Pages are intact and are not marred by notes or highlighting, but may contain a neat previous owner name. The spine remains undamaged. Houghton Mifflin Harcourt Publishing Company, 2003. Hardcover. Good. Disclaimer:A copy that has been read, but remains in clean condition. All pages are intact, and the cover is intact. The spine may show signs of wear. Pages can include limited notes and highlighting, and the copy can include previous owner inscriptions. At ThriftBooks, our motto is: Read More, Spend Less.Dust jacket quality is not guaranteed. Houghton Mifflin Harcourt Publishing Company, 2003. Hardcover. Very Good. Disclaimer:A copy that has been read, but remains in excellent condition. Pages are intact and are not marred by notes or highlighting, but may contain a neat previous owner name. The spine remains undamaged. An ex-library book and may have standard library stamps and/or stickers. At ThriftBooks, our motto is: Read More, Spend Less.Dust jacket quality is not guaranteed. Houghton Mifflin Harcourt Publishing Company, 2004. Paperback. Good. Disclaimer:A copy that has been read, but remains in clean condition. All pages are intact, and the cover is intact. The spine may show signs of wear. Pages can include limited notes and highlighting, and the copy can include previous owner inscriptions. At ThriftBooks, our motto is: Read More, Spend Less.Dust jacket quality is not guaranteed. Game Time: A Baseball Companion. Harcourt. Used - Very Good. 2004. Paperback. Very Good. Mariner Books. PAPERBACK. 0156013878 Ships quickly. Mild to moderate shelf/reading wear. STAIN ON PAGE EDGES, CREASING ON COVER CORNER. Orphans Treasure Box sells books to raise money for orphans and vulnerable kids. . Good. Harcourt. Hardcover. GOOD. Spine creases, wear to binding and pages from reading. May contain limited notes, underlining or highlighting that does affect the text. Possible ex library copy, thatâll have the markings and stickers associated from the library. Accessories such as CD, codes, toys, may not be included.